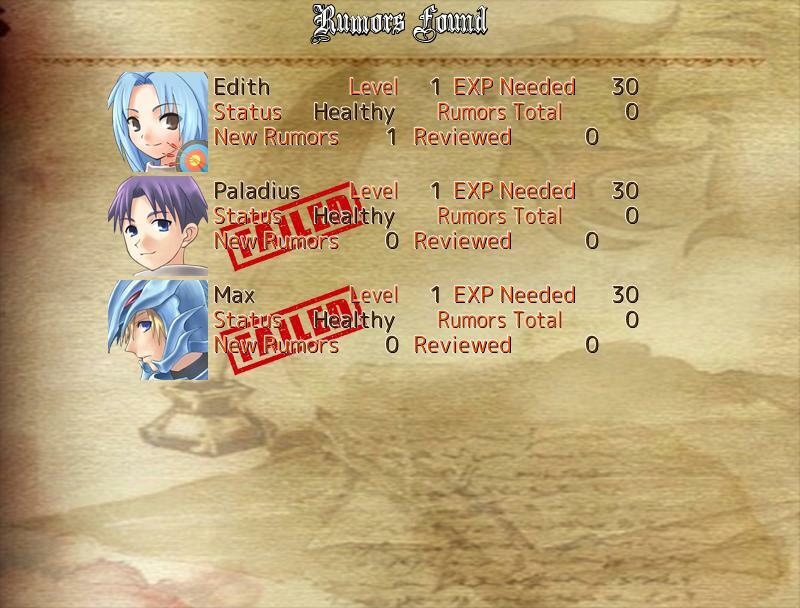 This script lets you manage your beloved rumors! It might look like some sort of quest book but it is not. Actually it does not offer a way to finish quests because it is all about eavesdropping! You might get some sort of motivation to find out more about it by finding one or more items that might convince you of visiting distant places. You should know that it has implemented a reserves or reservists system, so it will never allow you to send active heroes to collect rumors. It will send extra heroes to the reserves if your current team exceeds the maximum number of party members. By the way, you will need to configure the rumors by editing two TXT files. Do not forget to include the krumorsparse.rb TXT file contents in the script editor! KRumors XP already includes a reserves or reservists system so it will not work with any similar system. 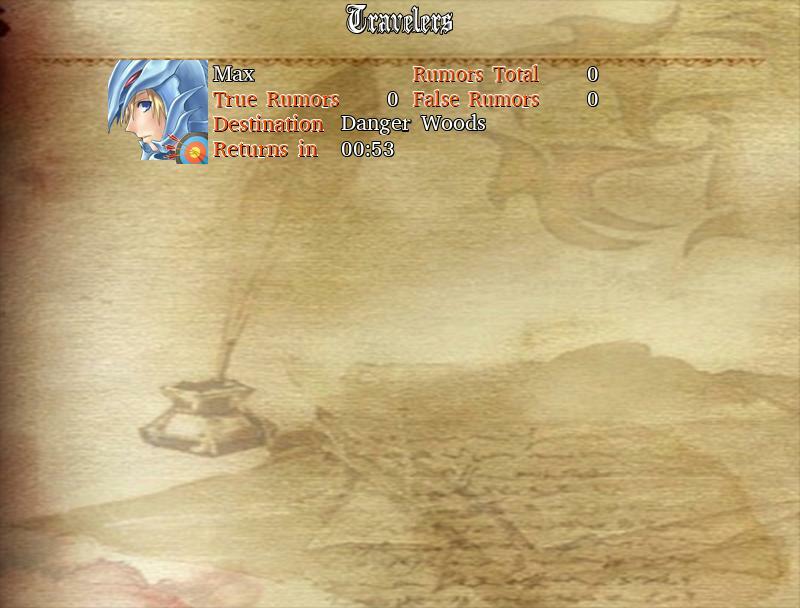 It is possible to setup the damage mechanism via @hurt_heroes in case you want to hurt the travelers or keep them sound. KRumors.hurt_heroes allows you to change this setting in game. Since version 1.0.10 or so KRumors works well with a stripped down version of Kuests XP. In a future full versions of both scripts might be required but I will see if I can make it fully optional. Demo and Graphics have been included! Well, including my name in your game credits is mandatory. If you go commercial, you got to pay me a small amount of money for crafting this script, obviously. I have uploaded some new KRumors XP demo because Maracuyá was unable to fully test the previous version. The current demo demonstrates my script is practically finished except for some minor details like figuring out what to do with reviewed rumors whenever there is nothing left to do there. Of course, that is something I might prefer to ask you all for feedback since there might be several ways to deal with them like trashing rumors at once or creating new quests, etc. So what would you like it to do then? Got any other ideas? Yeah, I found a minor bug that would not let the script run on vanilla RMXP games but it would work flawlessly on HiddenChest. Don't worry! I have fixed it by now! Bumping Because Gossips Keep Coming! Yeah, well, I am not implying that eavesdropping is good at all but this time we could make an exception because I have updated KRumors XP in order to add two new features. 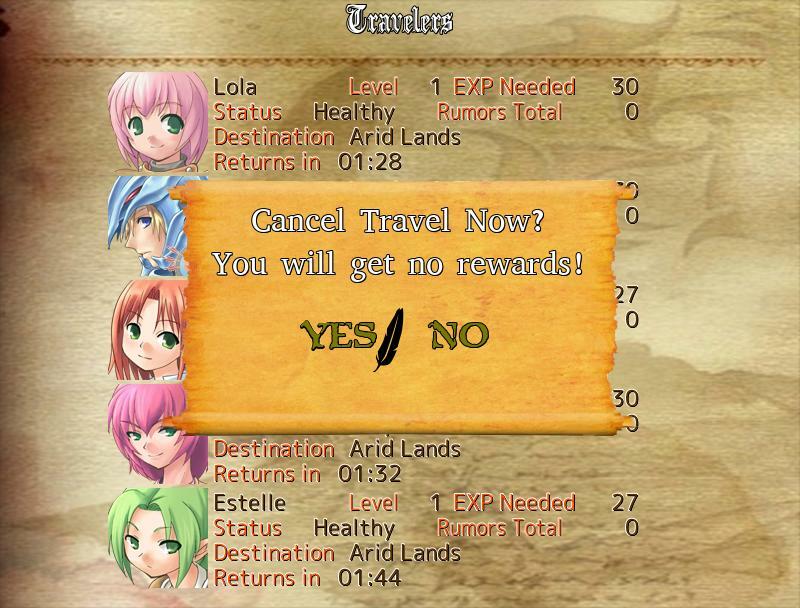 The first feature consists in adding quest IDs in case you want the active team members to go on an adventure! (Obviously that will depend on what quest system you want to implement in your game. ) 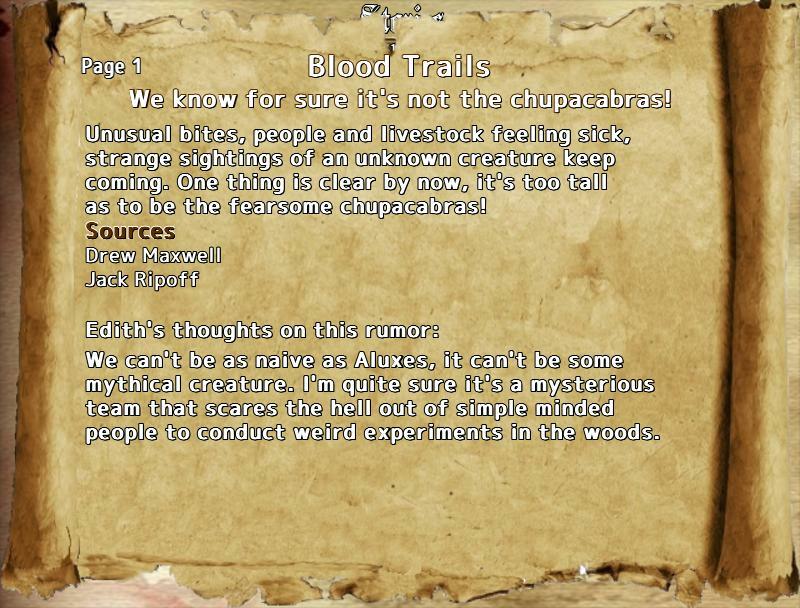 The other one is nothing but a way to keep some or all of the stories included in the rumors as part of your game lore. You will be able to reread them as many times as you wish. What makes it interesting is that you will not get a whole book from the very beginning but single pages! Right, I almost forget to tell you I uploaded it to box web hosting site as well. I have updated the KRumors demo once again to include several changes in screen layout, except I did not really change graphics. It is more data related than anything else, you know. 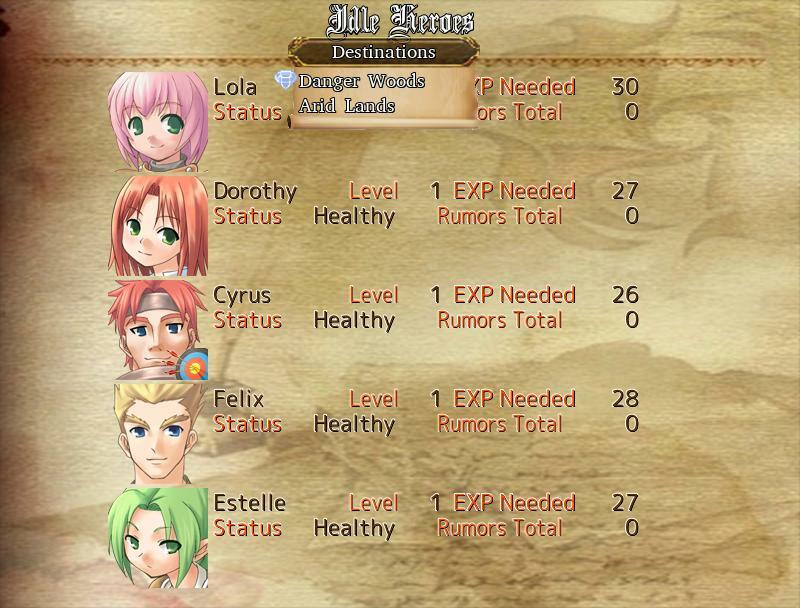 You are also able to keep track of all of the strange stories you have collected while looking for rumors aka strange version of quests. Sadly it will only show the first page... for now. Later on it should let you check out all pages and even read heroes' thoughts on the current rumor / story. Well, this time I have finally implemented the pagination feature in the stories section, but I have not done anything regarding heroes' thoughts. Even so you can let the complementary script parse those thoughts already. 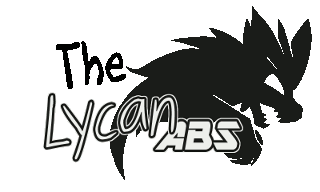 Plus I have reimplemented the updating list banner of yore! By the way, you will also notice that rumors now include the sources list so you can recall who the hell told you about any silly rumor. 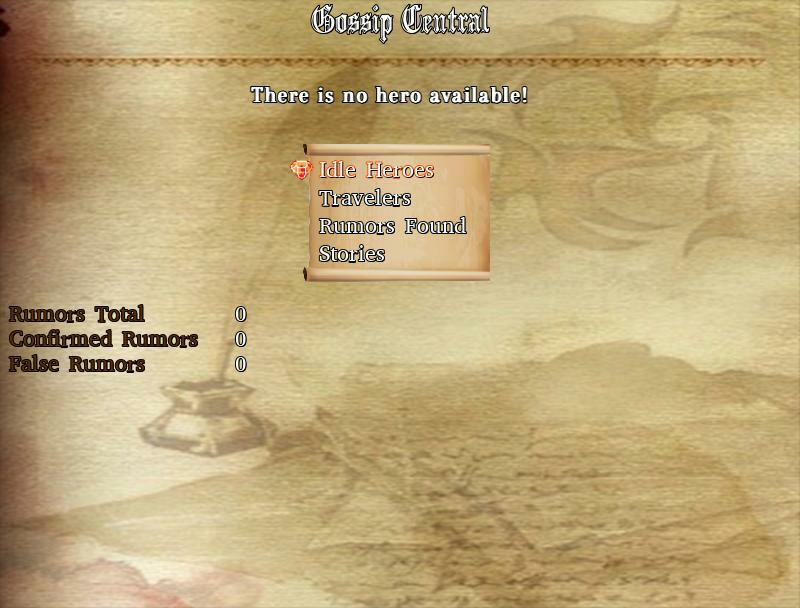 This also reminds me that you can get two kinds of rumors now, those that will only be accessible via your beloved rumor menu and the ones that can only be assigned via script call. You see, there is a reasoning behind this, as Maracuyá might say at some point... There is nothing preventing active heroes from learning about any gross gossip that might have been lurking around lately. It is not like I want your heroes to be eavesdropping the whole time. Once you get a rumor, no matter how you wrote it down, it will be assigned to a specific book of sorts that will keep track of all pages related to that topic. An example would be the book entitled Critters that tells you about two strange bloodsucking monsters. We are not safe here! 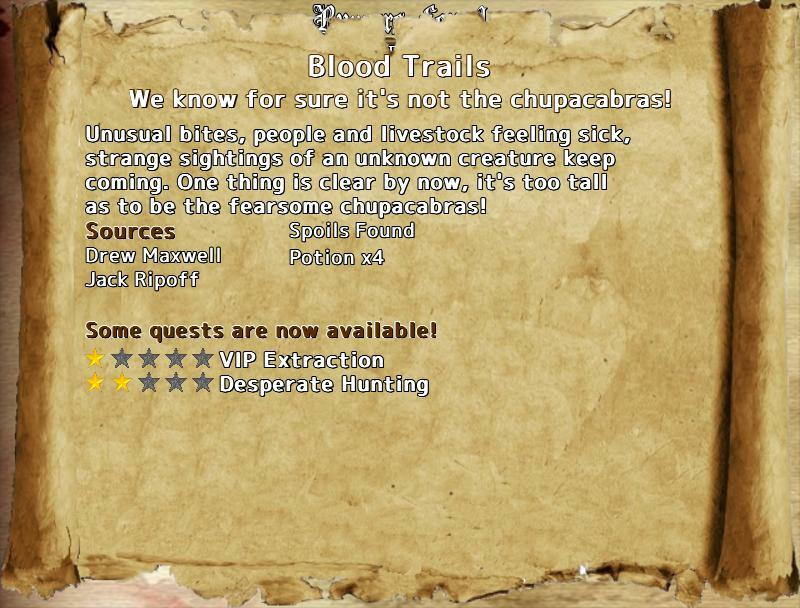 And do not forget that rumors they find via the menu will also let the party earn interesting prizes or spoils or just stolen stuff! Beware! Reserves can also get slightly injured during each trip to unknown locations. The Bump Got Hit by an Angry Artist! OK, I might have exaggerated a little bit here... The thing is that I have upgraded KRumors XP once again, as usual I might admit. Now a hero's thoughts on a rumor are fully visible, unless there is none to be displayed. The only thing left to do here would be to ask you to recommend some good fonts I could freely include in my demo and games to improve readability as much as possible. I had to update it a couple of times already so go ahead and download the script once again! My script has reached the 1.0.8 already. I think KRumors is feature complete unless somebody around here says otherwise by requesting some great feature. The Bump Forgot it Needed to Stay Away from Flashy Troubles! The curious truth is that I have uploaded a maintenance update of KRumors to fix, err, to prevent a game developer from getting a horrible crash in case he or she forgot to setup any rumor book or page. Actually you are supposed to setup all of the rumors as a book page by assigning a book ID and then some page ID. If you are like me and think you are quite lazy, you might have forgotten to do so. In that case the script will do its best to stop you from trying to find a non existing book and page by not showing any extra space or not trying to sort pages by ID when nil from the NilClass has no such numerical value. Thus I do recommend to get version 1.0.9 as soon as possible, unless I had uploaded a newer version of my script after I have posted this bumpy reply. I know it, you know it, I have updated KRumors XP once again. Do not even try to fool me by telling me you never saw this was coming your way! Well, now it is possible for you game developers to setup the damage mechanism via @hurt_heroes (located in your beloved KRumors module) in case you want to hurt the travelers or keep them sound. KRumors.hurt_heroes allows you to change this setting during gameplay as many times as you might ever need it. I have been wondering if this will ever protect the bumping paparazzi or not.